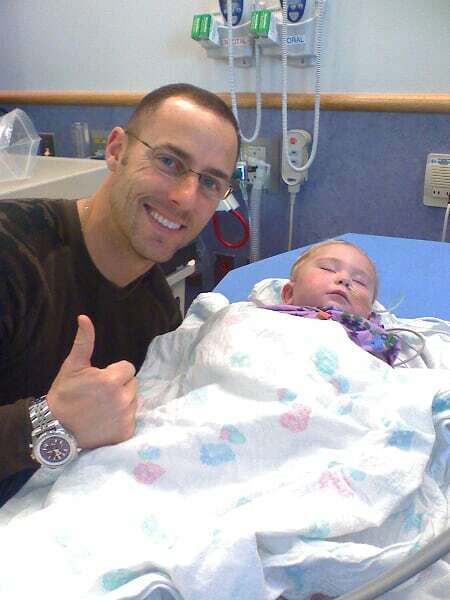 One of Riley’s first visitors after surgery was David Ackers from the Eagles. I think Daddy was more excited then Riley, but the whole thing was awesome! Finally a pic of Riley and Dr. Spray, his heart surgeon. Riley and Granny. Huge Thank you to Granny for being here at 6:30 this morning to help to get us through the day. Riley and his girlfriend Jackie. Thank you, also, to Jackie and Dennis for coming to CHOP today. The both of you coming into our lives has been one of the best things to happen. I think that Granny did a great job explaining what happened today so Im not going to repeat it. Right now, though, it’s 7:30 pm, and Riley is resting peacefully. He is on Morphin for pain which is keeping him pretty sleepy. This is good, though, because he is kinda stuck in the bed. He has an NG tube to drain his belly, and they are draining through his G Tube also. Ok…have to run. His night nurse is here and I would like to talk to her. Thank you for all your support! !